With a growing collection of over 30 local breweries and taprooms, microbrew enthusiasts will feel right at home in Vancouver USA. Talented brew masters have palettes covered with a wide variety of handcrafted brews from hoppy IPAs and heavier stouts to well-balanced ales and sunny wheats. Visitors can sample award-winning flavors of the Couve brew scene at Loowit Brewing, recent Silver Award winner at the 2016 World Beer Cup for their Grimlock Rye Porter, and Heathen Brewing Feral Public House, past Battle of the Brews winner at the Oregon Brewers Festival. Enjoy what&apos;s on tap at one of the new breweries including Fortside Brewing, east-side&apos;s Tapped Brewhouse and Pub, and Uptown Village&apos;s Trap Door Brewing. Many brew spots also feature tasty bites like juicy burgers and steamed mussels, or offer a rotating selection of local food carts adjacent to their establishment. 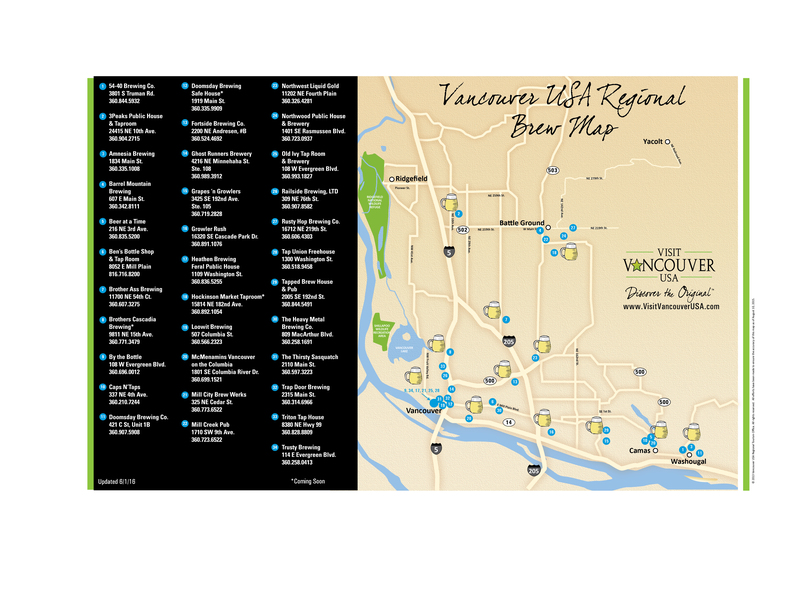 For a full list of breweries, visit our website for a regional brew map.